Two way audio security cameras enable you to talk to your children and elderly parents, keep tabs on your home or business, have fun with your pet dog & cat even while you are away from home. Here you’ll get the deep insights on what exactly security cameras with two way audio are, top 5 features to consider before making your purchase, the best picks, and hot FAQs. 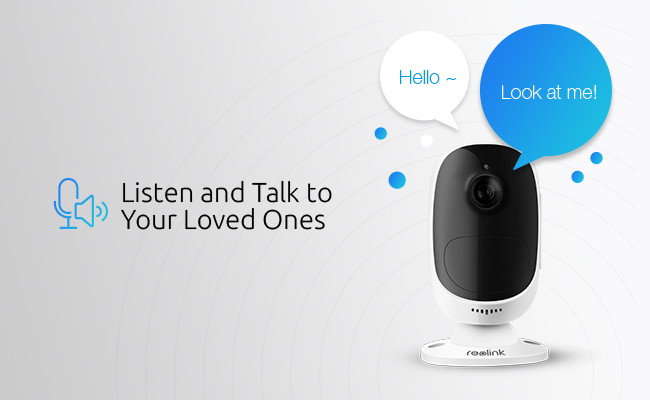 Wired cameras or WiFi security cameras with two way audio typically have built-in microphone and speaker so that you can listen and talk to your family in real time. There are 3 kinds of audio modes in 2 way audio security cameras: simplex, half-duplex and full-duplex audio transmission. You can have a full knowledge of the 3 audio transmission modes in the below chart. Send/Receive You can send data but cannot receive. You can both send and receive data but only one at a time. You can send and receive data simultaneously. Performance Full-duplex audio transmission works better than simplex and half-duplex audio modes, as it doubles the utilization of bandwidth. IP home security cameras with two-way audio use either half-duplex or full-duplex audio transmission mode. In 2 way audio IP cameras with half-duplex mode, audio is sent in both directions. However, only one party can send or receive audio data at a time, which is similar to a walkie-talkie. In In two way audio cameras with full-duplex mode, both parties can send and receive audio data through two-way audio IP security cameras at the same time. In other words, you can chat with your family or children similar to the face-to-face talk. You can listen and talk to your kids, your elderly parents, and loved ones anytime you like. You can let a delivery man leave your package in the place you prefer. You can give your pets orders to let your furry friends not rock the boat. You can scare off any potential thieves by the verbal warning. As you may notice, there are security cameras with audio recording in the market. Security cameras with audio will record audio while doing video recording. You cannot talk to your children or family with this type of security cameras. Home IP security cameras with two-way audio, on the other hand, offer you real-time communication as well as audio & video recording. In the market right now, the majority of traditional PoE bullet and dome security cameras, especially the outdoor type, will not have the two-way audio function. Those PoE outdoor security cameras are usually installed in high places, such as the eaves. You may not hear the voice clearly since the cameras are installed high above the roof (if the cameras are with bidirectional audio). If the installation environment is noisy, it’s even more difficult for you to get high-quality two-way communication. So if you want to find PoE security cameras with two way audio, it would not be the best choice. For high-quality two-way audio and easy setup, those smart home security cameras with two-way audio, such as baby monitors and battery powered security cameras, would be a better option. You can now skip to the next part to check top 5 essential points when buying best outdoor & indoor security cameras with two way audio. By considering the below important features, you can buy the best two way audio outdoor & indoor camera for your elderly grandparents, or as a baby monitor, for confirming package delivery or monitoring your driveway, aiming at deterring car thefts, etc. The sound quality in a two way audio network video camera should be your No.1 checking point. The volume of the audio of the two way audio surveillance cameras. The clarity of the audio. If there is any delay in the two-way communication. There are 3 easy ways you can use to check the two-way audio quality of the CCTV surveillance cameras. Way 1. Read the feedbacks of previous customers to check the overall performance of the two way audio camera. Way 2. Check on the audio & video sample of a two-way audio security camera on YouTube. Let’s take Reolink Argus® 2 as an example. Reolink staff uploaded a video to its YouTube channel, showing the two way audio quality. Thus you can see the sound quality before making your order. Way 3. Check the two-way audio IP camera reviews written by the professional editors of top-tier media. Waterproof in security cameras with two way audio is indispensable when you want to monitor the outside surroundings of your home and business. Take IP65 outdoor security IP cameras with 2-way intercom as a typical example. Bi-directional audio security cameras with weatherproof rating can protect the cameras from water jets and dust. You can place this kind of two way audio outdoor IP security cameras anywhere without worrying about the rain or snow. When there are any potential thieves approaching your house, you can hear what’s going on via the speaker, and scare off the invaders via the microphone before they break in. You can watch the below video to see how an IP65 battery two-way audio security camera braves the cold (shared by a customer). The night vision in both outdoor and indoor IP network security cameras with two-way audio is really important. When you install a PTZ camera with two way audio and night vision in your baby’s room, you can sing a lullaby via your iPhone or Android smartphones to hush your baby to sleep at night. You can also check whether your baby has a sound sleep at deep night without having to get up. If you install a two way audio pan tilt night vision security camera, you won’t miss anything happening both day and night. Burglars are not rare any more. Your home security at night cannot be ignored. With a WiFi or PoE half-duplex or full-duplex audio security camera with night vision, you can get peace of mind both in daytime and night time. 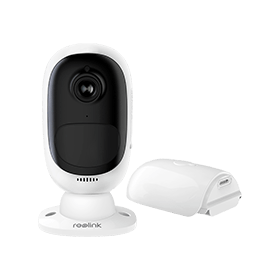 For example, Reolink C1 Pro, a mini WiFi IP camera with two-way audio function, offers 40ft infrared night vision distance, so you can see things very clearly even in the dark. This two-way audio camera has black appearance and housing, which is hard to be detected by others. If you want a rather hidden two-way audio security camera, this one is worth a bet. You can watch the below video that shows the night vision quality of Reolink C1 Pro two way audio video security camera (shared by a pet lover). Another advanced night vision technology used in security cameras is starlight. Starlight security cameras can provide much clearer night vision images than infrared security cameras when in the same light conditions. You can take a look at the below starlight color night vision video captured by the starlight two-way audio security camera Reolink Argus 2 (shared by a customer). Outdoor motion activated security cameras with two way audio can send you real-time app push notifications, email alerts, and sound warnings. You can also get motion detection images or video clips to keep as evidence. 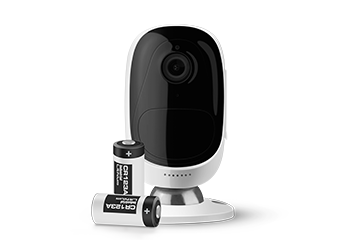 With motion detection alerts and recording, you don’t need to access the camera all the time. You can only view the camera once you receive the push notifications. There are 2 popular types of motion detection two way audio security cameras. One kind of two-way audio cameras uses a special algorithm to detect motion events. The other type uses PIR sensor to detect the temperature of the moving object to sense motions. The first type motion detection two-way audio security cameras compare the current frame with the previous one. If the security camera detects any changes, it will send you alerts instantly. 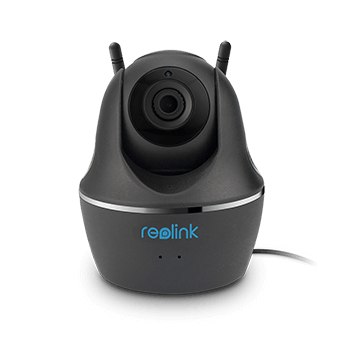 Take Reolink C1 Pro as an example. This indoor wireless security camera with two-way audio can send instant alerts to you when it detects anything unusual based on its inner complicated algorithm. The PIR motion detection two-way audio surveillance cameras detect changes in the amount of infrared radiation impinging upon the PIR motion sensor, which varies depending on the temperature of the moving objects. For example, Reolink Argus® 2, a battery powered security camera with push notifications and two-way audio, detects movements via its built-in PIR sensor. You won’t be bothered by the false alarms triggered by waving tree branches. World's First 100% Wire Free Weatherproof 1080p Full HD Security Camera. No Cords, No Installation, No Subscription or Monthly Fee. It’s natural that you don’t want to buy a two-way communication IP camera that is too complex to install or operate. DIY security cameras with two-way audio are a nice option for you. You can choose 2 types of two-way audio security cameras that are very easy to install or set up: battery powered two-way audio cameras and WiFi IP cameras with bi-directional audio. Battery powered wire-free security cameras with two-way audio are almost the easiest type security camera for you to install. Just place it in your preferable place and all is done. This type of two-way audio security camera is also suitable for securing your property without Internet or power supply. Wireless two-way audio cameras only need one cable for power. Just plug the wireless outdoor or indoor security cameras in the power outlet, and you’ve finished the installation step. When you need to mount your two-way audio security camera to the wall or eave, you should use the accessories, such as a bracket to mount it to the wall firmly. When you buy two way audio security cameras, don’t forget to count the above top 5 features in. Thus you will get a nice and high quality two way video camera that worth your money. You can take a look at the below megapixel two way audio security cameras that are quite popular among the market (with FREE shipping). The below two way audio security camera recommendations can work standalone, or work seamlessly with the accessories, such as a solar panel, an NVR, etc. Also, a lot of professional tech editors and customers give high praise to the below 2 way audio CCTV surveillance cameras — that’s also one of the main reasons why we pick these cameras. As one of the best outdoor wire-free two way audio IP cameras, you can install it simply by inserting the battery into the camera. If you want to buy an affordable outdoor IP camera with two way communication for your elderly parents or grandparents, this camera would be a nice option. You can talk to your family in real time and check on them to make sure everything is on track. The weatherproof design in this two way audio outdoor IP camera enables you to place it in your front door and porch, or the outside of your garage to monitor the visitors anytime you want. You can add a solar panel to this battery powered two way audio security camera for continuous power supply. If you are looking for a two way audio security camera as a nanny cam or baby monitor, this camera won’t let you down. You can install this WiFi indoor two way audio security camera simply by plugging it into the outlet. If you want a two way audio security camera system, you can buy an NVR for 24/7 video recording. So you won’t miss anything while you are outside or on vacation. We list some common issues that you may have when using two way audio security cameras. If you have other questions, please leave them in the comment below. We will add your questions in this FAQ list. A 1: If you cannot activate the two-way audio of your security camera, you can try the below handy solutions. Solution 1. Check whether you’ve used the two-way audio function correctly. Most two-way audio security cameras use push-to-talk (PTT) to activate this function. Solution 2. Keep the camera way from other electronic equipment to avoid feedback. Solution 3. Check the Internet connection of your two way audio cameras. Solution 4. Update your two-way audio camera firmware to the latest version. Solution 5. Reset your 2-way audio surveillance video cameras. A 2: While the audio recording in video surveillance security cameras can be restricted in some countries, it is a good idea to check with your local authorities. You can check this summary of each state’s audio recording laws here. Audio recording would be an invasion of privacy if you don’t handle it properly. You can turn off the audio recording if it’s not allowed by the local laws. If you have any questions about two-way audio security cameras, or any ideas you wanna share with us, please leave them in the comment below! This entry was posted in Buyer's Guide and tagged audio recording laws, intercom, two-way audio cameras. Hi. I just want to say thank you so much for this very helpful information and the time you put into it.